Disembark from the American Duchess and walk across the street to enjoy the beauty of Oak Alley’s rich past. Located on the Mississippi River between the historic Louisiana cities of New Orleans and Baton Rouge, Oak Alley Plantation has been called the "Grande Dame of the Great River Road.” Nowhere else in the South will you find such a spectacular setting! The quarter-mile canopy of giant live oak trees, believed to be nearly 300 years old, forms an impressive avenue leading to the classic Greek-revival style antebellum home. Oak Alley’s setting will remind you of the movie “Gone with the Wind” and makes you feel like you are on a Hollywood movie set. During this included tour, enjoy a guided tour of the Big House and explore the magnificent grounds. SOUTHERN HIGHLIGHTS - Experience the best plantations, gardens, music and cuisine all in one incredible journey. 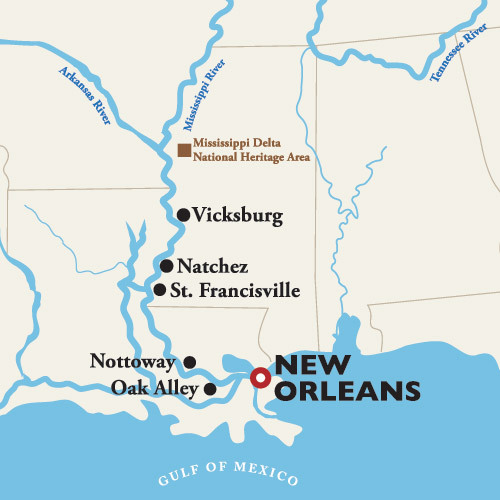 From the legendary jazz of Bourbon Street to the wonderful mansions of the Antebellum South, this voyage is an immersion in Southern culture. Soak in the Antebellum spirit as stately Southern belles greet you at the impressive tree-lined entrance to Oak Alley Plantation and discover a decorative wonderland of romance at Nottoway Plantation. Prepare to be astonished by historical revelations and embrace the relaxing pace of life on the river.